On the Monday before Thanksgiving, St. Mary’s Health Care System colleagues and volunteers donated over 350 turkeys weighing almost 6,000 pounds total to the Food Bank of Northeast Georgia to help families in need this holiday season. Each year, St. Mary’s gives a free turkey to each colleague and volunteer as a token of appreciation for their dedication and service. 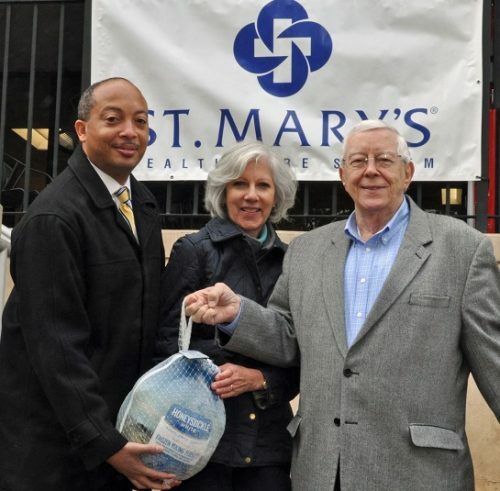 During the week before Thanksgiving, frozen turkeys were handed out by system leaders at St. Mary’s Health Care System in Athens, St. Mary’s Sacred Heart Hospital in Lavonia, St. Mary’s Good Samaritan Hospital in Greensboro, as well as ancillary facilities in Athens, Bogart and Watkinsville. Each turkey comes with safe cooking information and preparation tips developed by St. Mary’s food service partner, Sodexo. St. Mary’s makes it easy for colleagues to donate their turkey to the Food Bank if they wish to do so. All the colleague is asked to do is let Human Resources know they want to donate their turkey. The Food Bank will then pick up all the donated turkeys on the Monday before Thanksgiving.